* This results in greater stability. 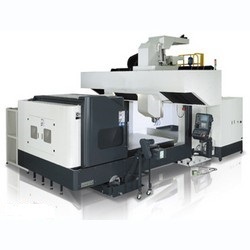 * The spindle head is located at the center of beam, providing high movement accuracy, superior heavy cutting capability and outstanding rigidity. * The spindle position is specially designed with symmetrical to center. The spindle, spindle motor ball screw and double counter-balancing cylinders are all properly located at the best positions to avoid unequal torque, while assuring the best structural accuracy. * The double counter – balancing cylinders on Z-axis are suspension supported. They are close to the movement gravity center, and are symmetrical to the spindle drive ball screw and the center of spindle motor. This optional position design not only fully eliminates the possibility of unequal torque, but also provides high-feed accuracy and machining accuracy. * Linear ways on X/Y-axis combined with box ways on Z axis.